Injured From Dangerous Scaffolding on a Job Site? Nearly 2.3 million construction workers perform their jobs while standing on scaffolding. That's nearly 65% of all construction workers. When scaffolding is improperly assembled or fails to meet the required safety standards, accidents are bound to happen. The Occupational Safety & Health Administration (OSHA) attributes nearly 4,500 injuries and 60 deaths per year to unsafe scaffolding. Dangerous planks and support are cited for causing nearly 72% of injuries in scaffolding accidents. If you've been injured in a scaffolding accident, you're not alone. Our law firm is here to protect your legal rights and get you the compensation you deserve. When multiple companies share a job site, you might discover that your injury was caused by another company's negligence. This is called third party liability and is different from a workers' compensation claim. Scaffolds must be sound, rigid and sufficient to carry their own weight plus four times the maximum intended load. Unstable objects must not be used to support scaffolds or planks. 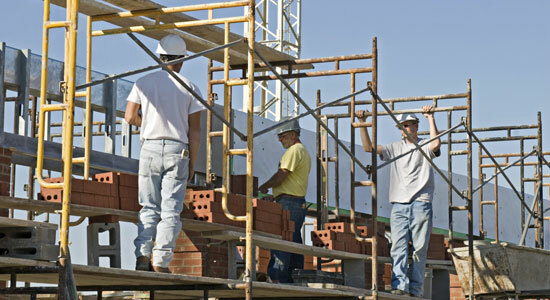 Scaffolds must not be erected, moved, dismantled, or altered except under supervision. Scaffolds must be equipped with guardrails, midrails, and toeboards. Scaffold accessories like ladders, braces, brackets, and more must be replaced if damaged or weakened. Scaffolds must be tightly planked with plank-grade materials. A "competent person" must inspect the scaffolding at designated intervals. Rigging on suspension scaffolds must be inspected prior to each shift. Synthetic and natural rope used in suspension scaffolding must be protected from heat. For more information, visit OSHA's webpage regarding Scaffolding Safety. In severe scaffolding accidents, the results can be devastating. Losing a loved one or family member to negligence can leave you frustrated, confused, and angry. We understand the shock of a sudden and unexpected death. We can help as you and your family plan for the future. For more information on your loved one's legal rights after a tragic accident, visit our page concerning Wrongful Death. There's no excuse for someone else's negligence, especially when it causes serious injury. Companies are held to rigorous safety standards to protect their workers. When they fail to meet these standards, it's the workers who suffer. We can help you get the respect – and compensation – you deserve after a scaffolding accident. With over 35 years of experience, we know exactly what it takes to succeed. Don't hesitate to call us; some time limits may apply to your injury claim. Contact us at 1-866-943-3427 or complete the form in the top right. To chat with our representatives, click on the box in the lower right corner of this page. We're available 24/7.